The most intelligent salon scheduling software on the market with algorithms that promote cluster booking and increase productivity. With busy clients, they demand 24/7 access to scheduling their appointments. Rosy’s Online Client Scheduling (OCS) offers online salon booking for the ultimate convenience for busy clients and salons alike. 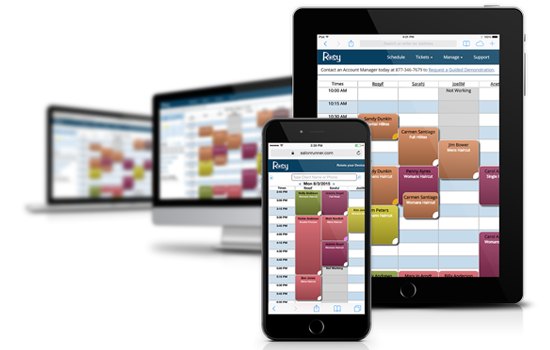 Rosy offers the most intelligent salon scheduling solutions that promote cluster booking, maximize your salon schedule, and will not allow unfillable gaps within your day. Through your own website or our Mobile Web App, the client has access to all of their history. You maintain control of how things are set up, while your clients can schedule appointments, purchase gift cards and packages, reserve products, update their profile and contact information, and more. Rosy’s Online Client Scheduling, as well as Text and Email Confirmations and Reminders allow your business to reduce no-shows and save you countless hours manually confirming appointments. Put your schedule on autopilot so you can better service your clients and build your business.